When it comes to fur trade history there is nothing quite as well known as the 100 enterprising young men ad. This first call for adventurous and ambitious mountain men has been known as what started it all. 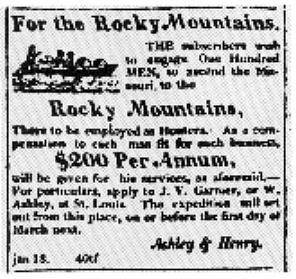 This advertisement appeared in Missouri Gazette & Public Advertiser, St. Louis, February 13, 1822. A similar ad was placed in Missouri Republican, St Louis, Mar 20, 1822 and in Missouri Intelligencer, Mar 16, 1822. 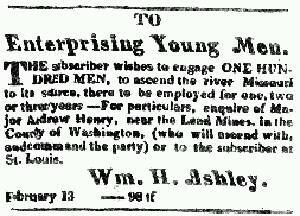 The subscriber wishes to engage ONE HUNDRED MEN, to ascend the river Missouri to its source, there to be employed for one, two, or three years — For particulars, enquire of Major Andrew Henry, near the Lead Mines, in the County of Washington, (who will ascend with and command the party) or the subscriber, at St. Louis. will be given for his services, as aforesaid.— For particulars, apply to J.V. Garnier, or W. Ashley, at St. Louis. The expedition will set out from this place, on or before the first day of March, next. Many flocked to the source of these ads in hope of financial success and exploring new lands. These days ads for adventure are few and far between, but the lucky who stumble upon them may go down in history like these brave mountain men.